The born-again Christian, who once dominated the calypso and soca scene here in St. Vincent and the Grenadines, says that he has absolutely no regret about the direction his life has taken, since he believes that his God allowed the things that happened to him to take place in order for him to be where he is today. âSignal was like being in school – I learned a lot and I taught a lot,â said the former front man of the mid to late 90s soca band which also featured giants in their own right Rondy âLutaâ McIntosh and Pat Ragguette. He said his tenure in the band was a great experience that taught him to be creative, and how to master different singing styles; the styles and creativity that are still being displayed in his gospel songs. Being in the band Signal took Papa Das to insurmountable heights with regard to fame and fortune, but his life as an entertainer did not start there. Glasgow first entered the spotlight when he placed second in the Junior Calypso Competition in 1980. 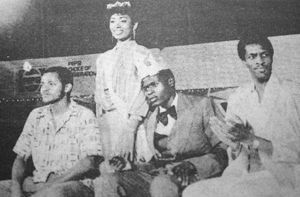 In 1981, he took his first junior title, then eight years later he not only captured the junior title, but was also crowned senior king with his two songs, which included the still popular âCaribbean Womenâ. The following year he retained the national crown but was dethroned on his way to the hat trick in 1991. After almost two decades in the entertainment industry, the singer decided to make a change of direction. The 37-year-old, who acknowledged growing up in a religious home, left the band to migrate to the United States. Shortly after that, he traveled to the Tortola, BVI, where he re-dedicated his life to Christ and has been living since. The transition from an entertainer was difficult at first for Papa Das, but things soon turned around for him. A father of four (three boys and one girl), Glasgow has been married to his wife Mayferne for the past seven years. Currently he is a warehouse operator for the leading distributor in the BVI. Spiritually, Glasgow is moving in the direction that he believes that he is being led by his God. He is a minister at the New Testament Church of God, has produced a gospel album, and is about to release his second. He has been nominated for a Marlins Award – for Best Gospel Calypso Song, and travels regularly performing and ministering the word of God. Looking at the current state of entertainment, both secular and gospel, Glasgow laments that gospel music lovers may be turned off by the high fees charged by gospel artistes for performances. He believes that the high prices charged are âdiscouraging Christians from turning up and out for events and showsâ. And although he admits that he was once a contributor, he finds that the exploitation of women, profanity and violence in music is getting way out of hand. The one time singer of songs like âBam Bam Rollersâ, âBulldozer Bumsieâ and âKicking up in the Partyâ, is now the one who belts out âSatan, your Kingdom is Fallingâ, âUnder the Bloodâ and âJesus is Alive,â with no regrets and hopes that others may follow in his footsteps.